PHOENIX — Mitch Haniger hit his 21st homer and had three hits, Mike Zunino added a solo shot, and the Seattle Mariners beat the Arizona Diamondbacks 6-3 on Friday night. Edwin Diaz pitched a scoreless ninth for his major league-leading 49th save, helping Seattle keep pace in the AL West and wild-card races. Diaz set a club record for saves in a season, passing Fernando Rodney’s 48 in 2014. Haniger, an All-Star who made his major league debut with the Diamondbacks in 2016 before being traded to Seattle, added two singles and scored twice. Mariners starter Erasmo Ramirez (1-2) turned in his longest outing of the season, allowing one earned run and six hits with six strikeouts and a walk. Ramirez dropped his ERA from 5.49 to 4.56. Zack Godley (13-7) allowed five runs and seven hits in five innings. The Mariners used a pair of doubles, three singles, a sacrifice fly and Dee Gordon’s hustle to plate four runs in the third inning. Gordon led off with a double, and with one out, his delayed steal attempt led to Godley’s overthrow of third base and allowed Gordon to score. Former Diamondback Jean Segura singled in a run, Denard Span hit an RBI double and Kyle Seager‘s sacrifice fly made it 4-0 before Godley escaped the inning. A.J. Pollock’s sacrifice fly in the fifth made it 5-1 before Zunino hit his 18th home run of the season in the sixth off reliever Matt Andriese. Throwing errors helped the Diamondbacks get closer. Segura’s low throw to first allowed Paul Goldschmidt to reach, and Ketel Marte doubled with two outs. 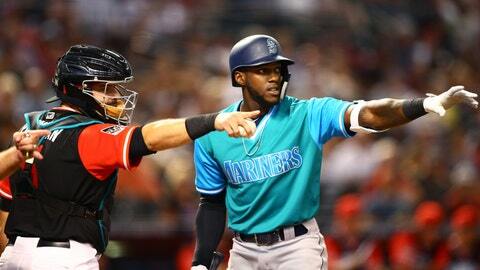 Both Goldschmidt and Marte came home when Gordon’s attempt to throw out Nick Ahmed at first one-hopped Robinson Cano. Nick Vincent, Alex Colome and Diaz closed out the Diamondbacks with scoreless innings. Arizona had won six of its previous seven games. Gordon tumbled on his head to catch a sinking line drive in shallow right field in the first inning, the first of the speedy second baseman’s two big plays. In the third, he tried to steal third base as the catcher was throwing the ball back to the pitcher. Godley, who has struggled throwing to bases this season, tried a slow overhand lob that flew over third baseman Eduardo Escobar’s head for an error, and Gordon scored easily. 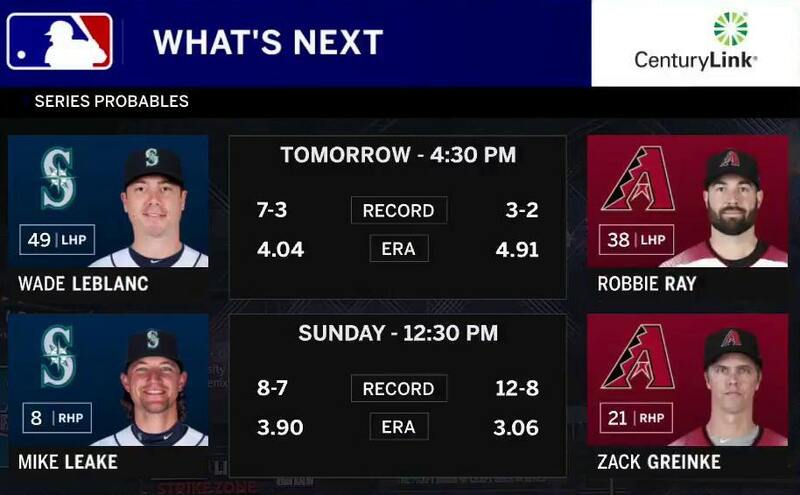 Diamondbacks LHP Robbie Ray (3-2) looks to end a streak of six straight no-decisions on Saturday when he faces Seattle. It will be his third career start against the Mariners. Mariners LHP Wade LeBlanc (7-3) will start against the Diamondbacks, and Sunday’s scheduled starter is right-hander Mike Leake (8-7).